What do ninjas, pirates and wrestlers have in common this November? The ability to come up with and command a 350 Free Spins Action Pack on your behalf the moment you make a $30 minimum deposit! There are three main things and characters that will rule your November: first, you’ll have the honor to play with a stealthy 100% Match + 50 Free Ninja Star Spins! In second place comes a brave 150% Bonus and 100 Free Goldbeard Spins. 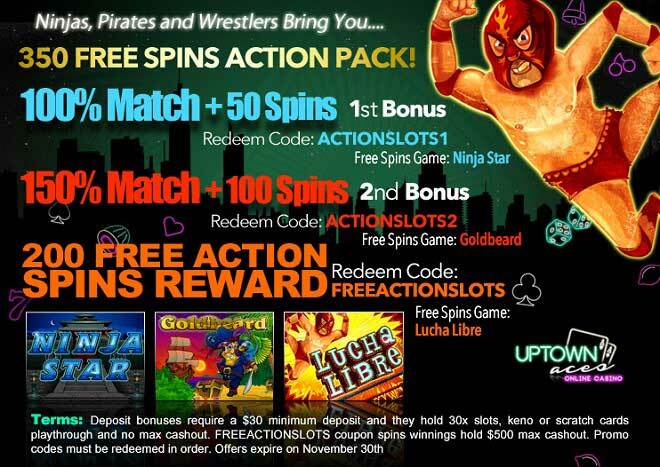 And after you’ve completed your bonuses, you’ll have access to 200 Free Lucha Libre Spins! Become a sleek ninja of wins, a fearless pirate of coins and come up with huge winning wrestler moves this November with your deposits of as little as $30! 200 Free Action Spins Reward!